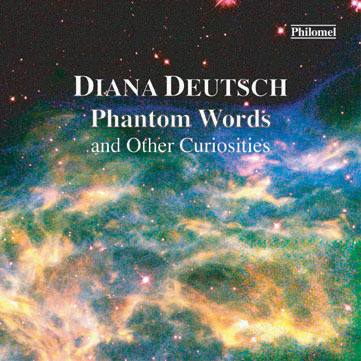 Phantom Words, and Other Curiosities presents a series of striking auditory illusions and curiosities of sound perception that Diana Deutsch has discovered. Much of this CD is devoted to exploring paradoxical relationships between speech and music. In one demonstration, a spoken phrase is repeated several times over. At some point, instead of appearing to be spoken, the words appear to be sung. Another set of tracks demonstrates a striking dissociation between musical tones and spoken words in memory. The CD is named after the first few tracks, which contain sequences of repeating words and phrases that arise simultaneously from different regions of space. The words coming from the different spatial locations are offset from each other in time. As a result, listeners are given a palette of sounds from which to choose, and so can create in their minds many different combinations of sounds. After continuous exposure to these repeating words, listeners begin to 'hear' words and phrases that are not really there. These 'phantom words' are generated by the brain in an attempt to extract meaning from the chaos of sound that is presented. A new musical illusion is also featured, called the 'cambiata illusion'. Two repeating patterns of tones are presented, one to each ear. Although the tones in each pattern differ markedly in pitch, many people instead hear two melodies formed by tones that are close in pitch, called 'cambiata patterns'. The brain rejects the jerky, improbable patterns that are being produced by the earphones, and reorganizes the sounds so as to create orderly patterns instead. This striking perceptual reorganization represents another attempt by the brain to create order out of the chaos of sound that is presented. The CD includes extensive spoken commentary, and comes with a 20-page full color explanatory booklet which explores these perceptual curiosities in detail. Musical Illusions and Paradoxes brings together a number of compelling musical illusions and paradoxes that were discovered by the author. The sounds as they appear to you are not only quite different from those that are really present, but they sometimes behave so strangely as to seem quite impossible. The illusions also show that people can differ strikingly in how they hear very simple musical patterns. For some illusions, namely the octave illusion, the scale illusion, the chromatic illusion, and the glissando illusion, disagreements tend to arise between righthanders and lefthanders, showing that they reflect differences in brain organization. For another illusion, the tritone paradox, perceptual variations depend on the geographical region in which the listener grew up, showing that the way we perceive music can be influenced by the language spoken around us. Using the principles that generate Deutsch's illusions, we can now produce music that sounds radically different from one listener to another, and even from one audience to another. The Compact Disc contains extensive spoken commentary, and comes with a 32-page full-color booklet which describes and illustrates the illusions in detail.